Our ancestors could be to blame for the wide variety of human sleeping habits, from larks to night owls. Staggered sleeping patterns would have been an advantage in the distant past, when we lived in groups and needed someone to look out for wild beasts, say researchers. 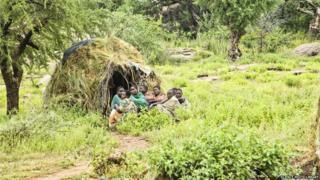 Anthropologists monitored sleep in the Hadza people of Tanzania who still live a hunter-gatherer existence. Over 20 days and nights, someone was awake for almost all of the time. "Out of some 200 hours for the entire study, for only 18 minutes were they actually all sleeping synchronously," said lead researcher Dr David Samson of the University of Toronto, Canada. "The median was eight individual adults who were alert at any given time throughout the night - so that's 40% of the entire adult population of these camps. "So, it was pretty astounding how asynchronous the sleep was in this group." Past research has shown that about 40% -70% of a person's circadian rhythm, or body clock, is genetic. The rest is influenced by environment and, interestingly, age. When factors such as nursing status, temperature, wind, humidity and other factors that affect sleep were taken into account, age was one of the drivers of the variation in sleep types, said Dr Samson, the lead researcher on the study. "When you are younger, you're much more owlish, so you're much more inclined to have your peak activity later in the day than to be up earlier in the morning," he explained. "When you're older, you're much more larkish." The research adds a new dimension to the "grandmother hypothesis", he added. According to this idea, having older people living in a group had some sort of evolutionary advantage. The researchers have come up with "the poorly sleeping grandparent hypothesis", which builds on this idea, he said. Older people waking in the night or getting up early because they could not sleep may have helped all members of the group survive hundreds of thousands of years ago. Animals living in social groups such as meerkats always have someone on guard during rest periods, a theory known as the sentinel hypothesis. Anthropologists decided to test this theory in humans by studying the Hadza people in Tanzania, whose lifestyle has changed little in thousands of years. The Hadza population live in camps of around 30 people and are hunter gatherers, eating game animals, birds, honey, berries and seeds. Anthropologists say their environment is similar to that in which all humans evolved. Hadza volunteers were given "super fit bits" that plotted their sleep patterns. The scientists found that over 20 days and nights, there were only 18 minutes when no-one was awake in the group of about 20 adults. Most sleep studies take place in sleep labs, making the research, published in Proceedings of the Royal Society of London B, somewhat novel.